Happy Easter! 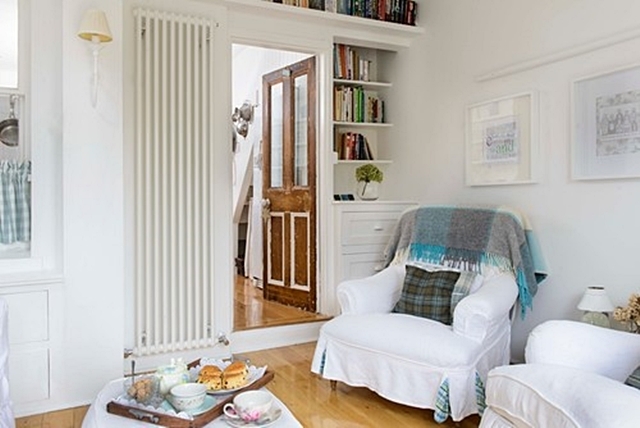 In honor of the spring holiday, I’m sharing an airy little cottage from Whitstable, England. 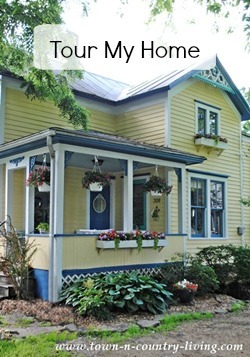 You’ll find this charming home tour to be filled with lots of white and natural light. 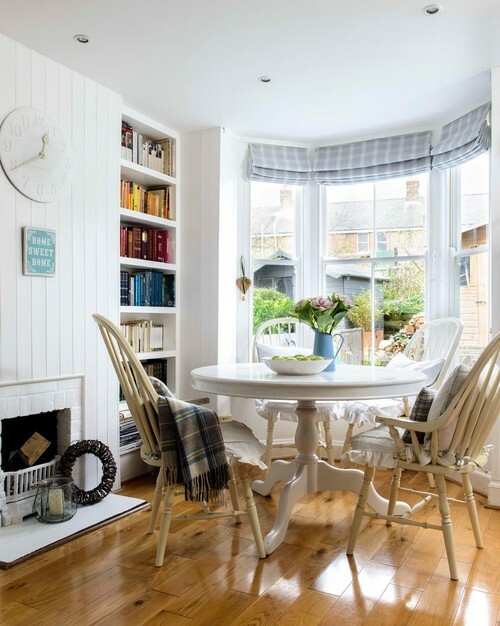 You can’t help but smile as you wander through this coastal cottage located in southeastern England. 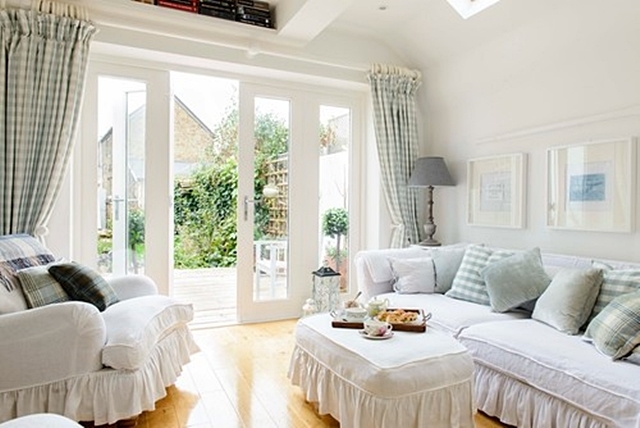 Pretty, white slip-covered furniture evokes shabby chic style in this light-filled living room with pale blue accents and light wood floors. Buffalo checks pair with plaids to add an element of subtle patterns. Did you notice the plaid pattern in the folds of the chair’s pleats? 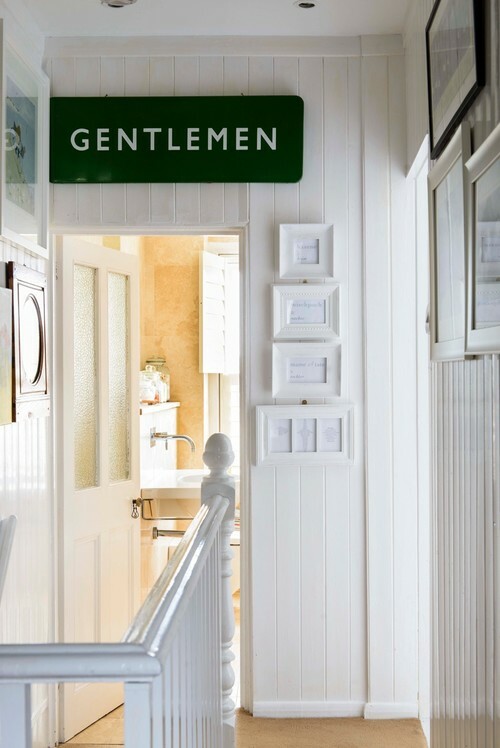 Attention to details like this are what make interior design interesting. Through the worn wooden door awaits the kitchen. 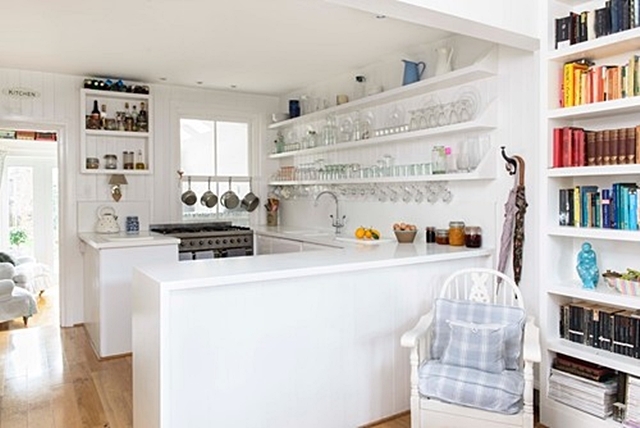 Open shelving and plenty of white makes the small, u-shaped kitchen fill more spacious than it is. The window looks out onto the living room. 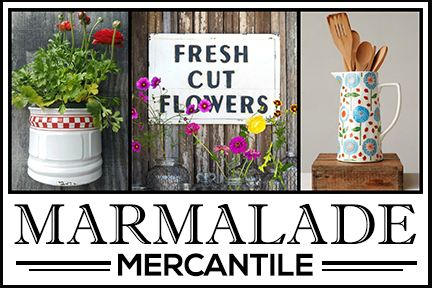 I remember my grandmother’s kitchen had a window that looked out onto the sleeping porch. They would pull the curtain closed when using their summer bedroom. 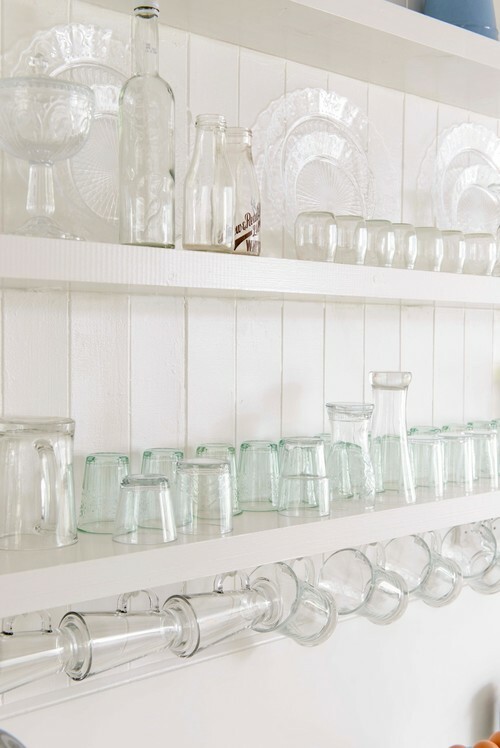 I love all the glass stacked on the open shelves in the cottage kitchen. It reflects light and I love the soft blue and green that the glasses give off. This is just the prettiest of dining spaces. 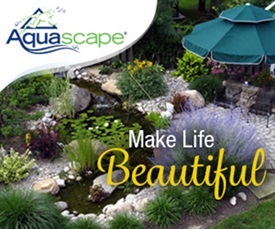 In summer, you can enjoy the view outside. During chilly winter months, the fireplace adds warmth and cozy appeal. 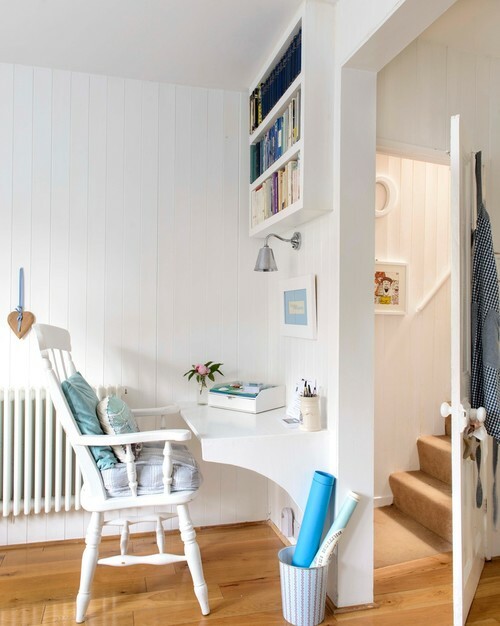 Making use of every possible space in this charming seaside cottage, an office is created in a corner by adding a shelf for a desk. Continued touches of blue remind you of the ocean just steps away. At the top of the stairway is a modernized bathroom. The upstairs hall is kept bright with liberal use of white paint. 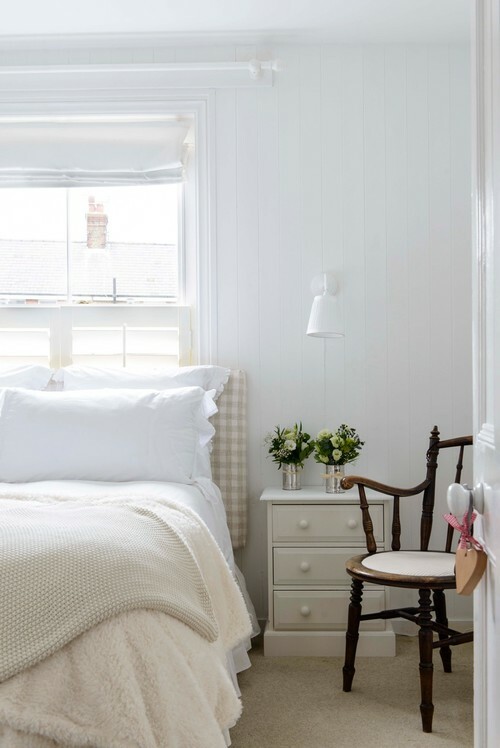 Soft, ruffled white bedding lends a hint of femininity to the cottage bedroom. Buffalo checks reappear on the upholstered headboard. 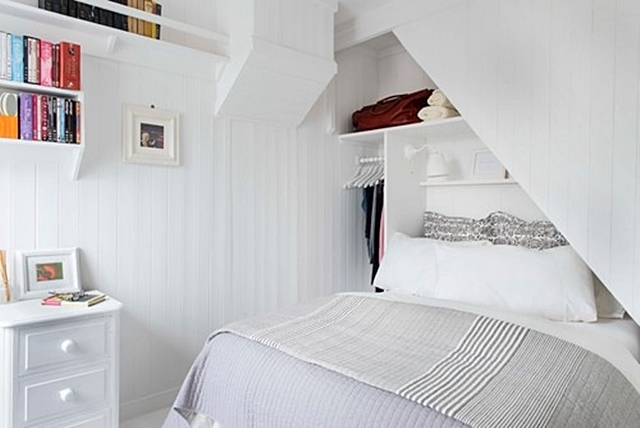 Rather than try to wedge a headboard in this space, the owners tucked the bed into the alcove and placed shelving overhead for storage. A small sconce provides light for night time reading. On the other side of the room, a simple roman shade allows unobstructed views of the seaside village. Such a pretty place to live! 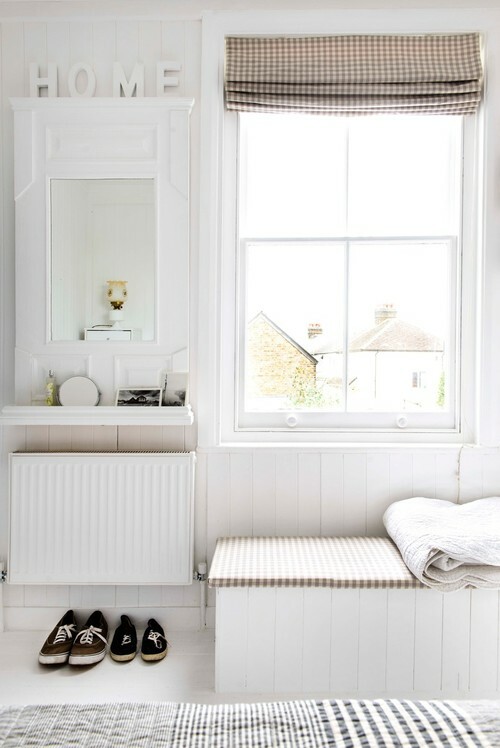 Now I want to paint my whole house white! That was fantastic! Thanks for sharing. 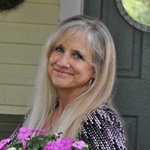 I am frustrated and want to cancel my subscription. There is too many pop ups and advertising. Loading this website is very jerky and slow compared to others I subscribe to.